Create a repeatable, sustainable lead generation process. There is no prerequisite at all. Learn this technique from scratch and implement the same to take any business, product or website to the next level. 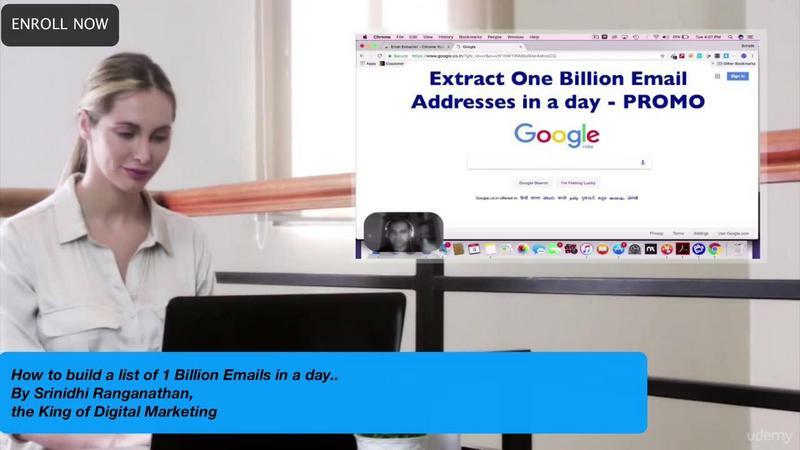 Get ready to extract tons of email ids in a day using secretive methods in lead-generation. Ultimate secrets and hacks that no-one will ever tell you. Finally - an actionable course on Advanced Lead-Generation has been launched here on Udemy. In this course, I will teach you on how to gain hands-on tactics for generating high-quality leads at the top of your sales funnel. You�ll learn actionable advanced lead generation tactics that you can apply to your business and almost any type of business to create a repeatable, sustainable lead generation process. Are you ready for Lights? Camera? Action? Then enroll in "Email Marketing Hacks: Build a Huge List of Email IDs". There is no time to waste. Get setting rolling and become an email marketing whiz kid in no time. Marketing Professionals, freelancers or startup company owners looking at e-mail marketing to promote their products. Anyone looking at generating e-mail leads either for their product launch or creating awareness about their products through e-mail marketing.